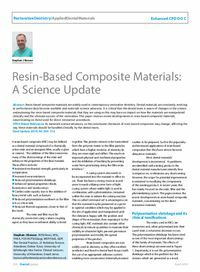 Abstract: Resin-based composite materials are widely used in contemporary restorative dentistry. Dental materials are constantly evolving as performance data become available and materials science advances. It is critical that the dental team is aware of changes in the science underpinning the resin-based composite materials that they are using as this may have an impact on how the materials are manipulated clinically and the ultimate success of the restoration. This paper reviews recent developments in resin-based composite materials, concentrating on those used for direct restorative procedures. Clinical relevance: As materials science advances, so the constituent chemicals of resin-based composites may change, affecting the way these materials should be handled clinically by the dental team. Objective: To understand the recent changes in the chemistry of resin-based composites and the clinical ramifications.